The Simien highlands of northern Ethiopia form one of the major mountain massifs in Africa. 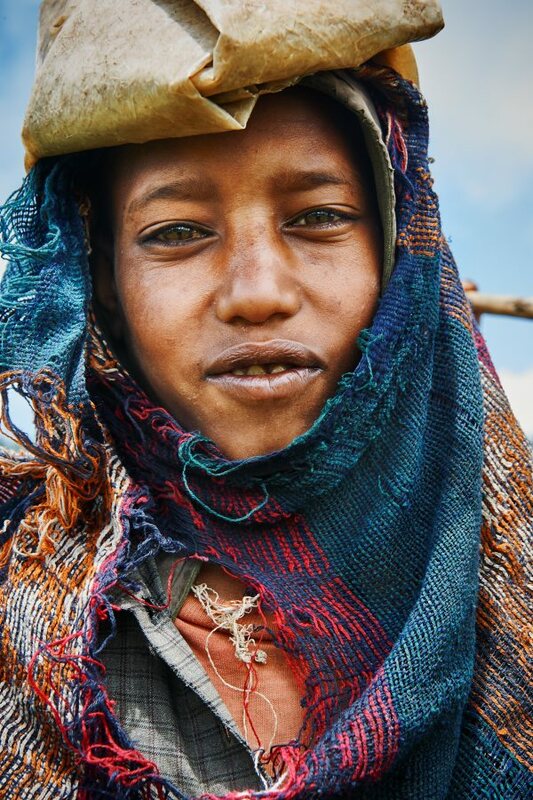 A highlight is the ascent to the summit of Ras Dashen - Ethiopia's highest peak and the fifth highest on the continent. As we trek through this isolated region we admire the spectacular scenery of rocky plateaus, spires, mesas and deep gorges. On our return we also visit Lalibela, home to the impressive rock-cut churches. 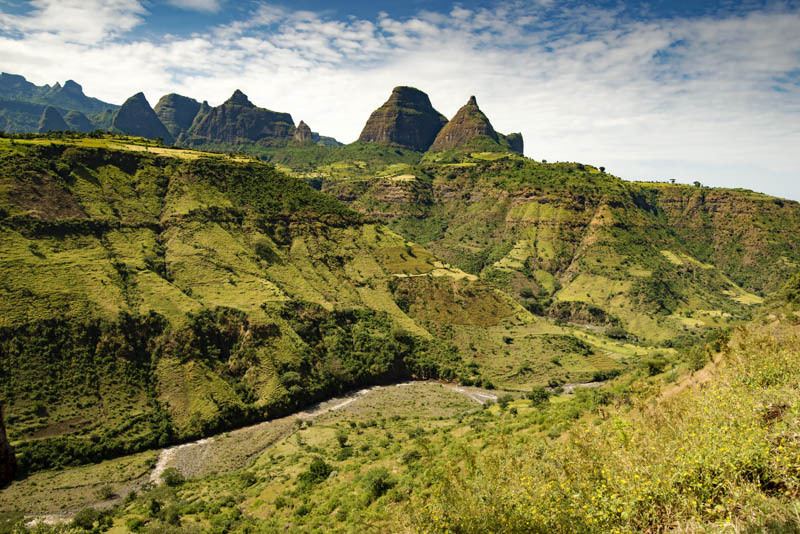 Simien Mountains: trek one of Africa's most spectacular and least visited mountain ranges in Africa. Ras Dashen: climb Ethiopia's highest peak at 4543m. Camping: enjoy wild camping in stunning locations. Gondar: discover the medieval Fasilidas Castle and Debre Berhan Church. 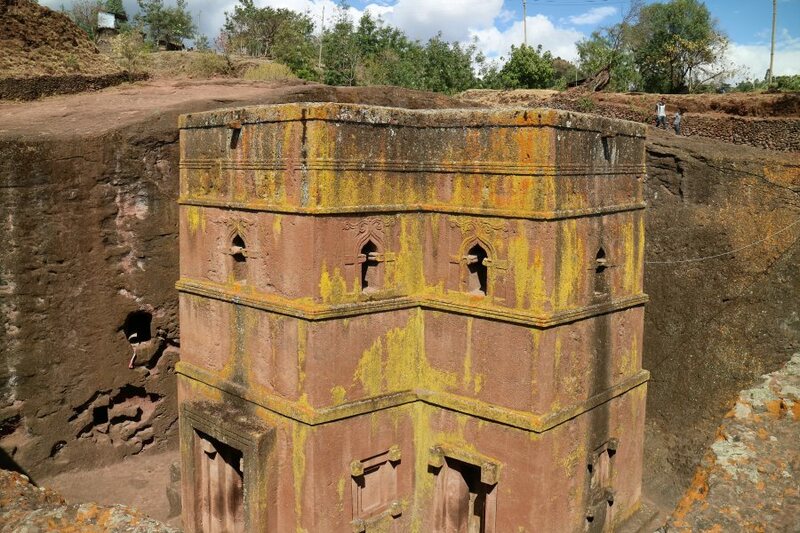 Lalibela: Explore impressive churches carved in rocks. Addis is situated at an elevation of around 2438m and is just over a century old. It has some elegant modern buildings and is quite spacious with wide streets and green areas. It remains the capital of a predominantly rural area and the Mercato is one of the largest open markets in Africa. This afternoon we will have an orientation tour of the city visiting the Ethnographical Museum and the church of the Holy Trinity, whose large dome and slender pinnacles make it a landmark in the city, followed by a drive up Entoto Hill to take in a panoramic view of Addis Ababa. 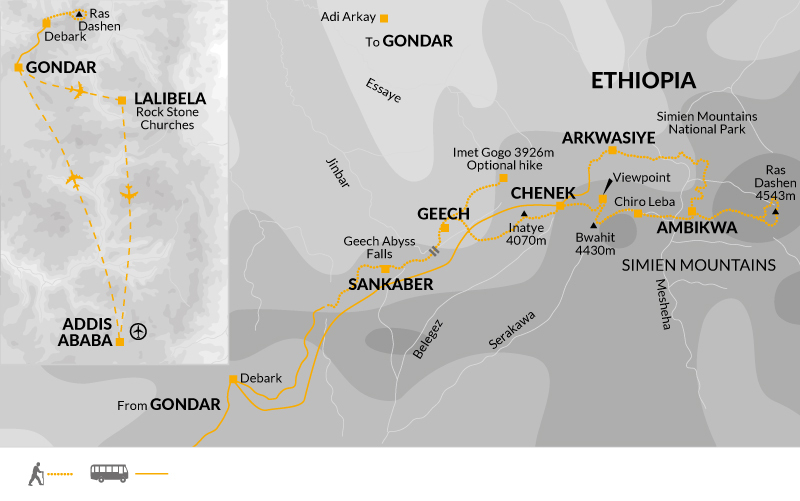 Today, we drive to Debark, the village base for hiking in the Simien Mountains.The range lies north of Gondar and many of the peaks rise above 4,000m with the highest being Mount Ras Dashen at 4,543m, the fifth highest in Africa. The mountains are criss-crossed with tracks made by the local people travelling from village to village or moving their animals to fresh pastures. The combination of these tracks and the spectacular scenery make for excellent walking. We start our trek with walk to our first camp Sankaber. Todays 5.5km walk is expected to take around 2.5 hrs. We trek today to Geech camp via Sankaber , with the possibility of seeing gelada baboons and red-hot poker plants en route. 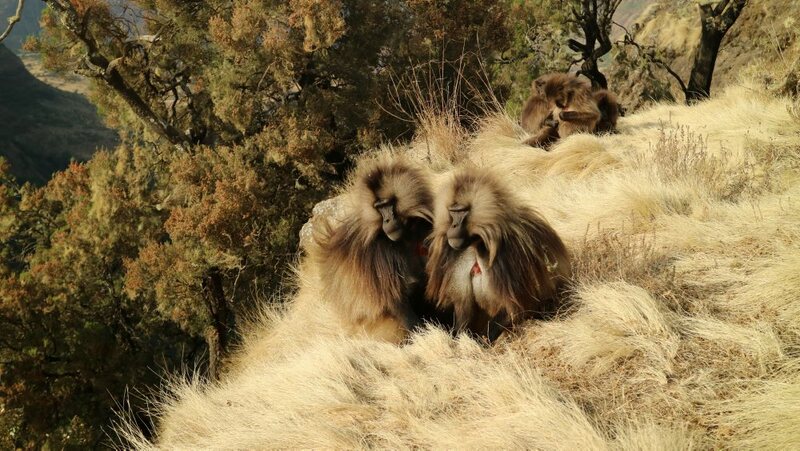 The gelada baboon is endemic to Ethiopia and has adapted to living on the nearly vertical cliff faces. We may also see the Jinbar river waterfalls today that plummet into Geech Abyss. The Abyss is a vast canyon cut into the main wall of the escarpment. Todays 12km walk is expected to take around 6hrs. A flexible day with a morning optional acclimatisation hike to the viewpoint of Imet Gogo (3926m). 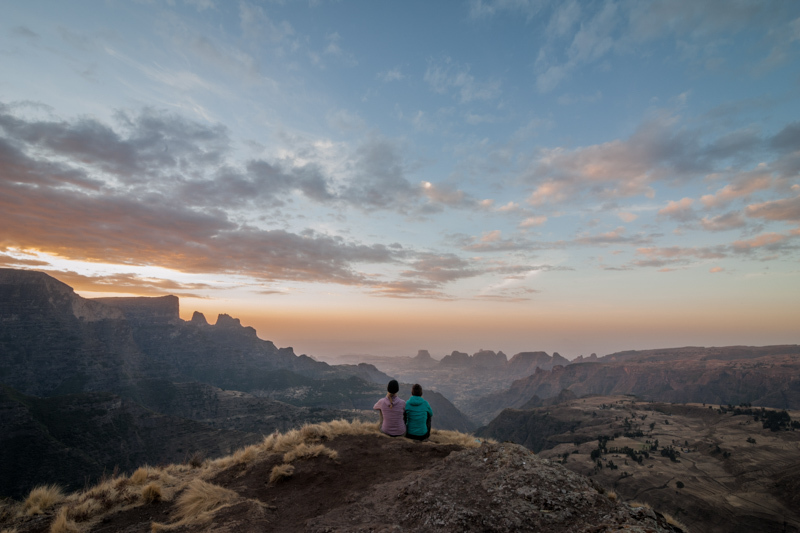 From the viewpoint there are spectacular views of the lowlands and across the Simien range with rock spires and mesas prominent. Keep a close look out for the elusive simien fox. It's misnamed as it is not really a fox but a member of the dog family restricted to Ethiopia. Todays optional hike of 10km is expected to take around 4hrs. We aim to trek to Chenek camp today on a good trail via Inatye (4070m) and along the escarpment . This exciting walk traverses the Jinbar river and provides us with fantastic views. You may like to take the opportunity to freshen-up in the nearby stream south of camp. Todays 13km walk is expected to take around 8hrs. Today we trek to Ambikwa and plan to stop at a spectacular viewpoint (4200m) north of Bwahit where, on clear days, we can see across the Mesheha river to Ras Dashen peak. We then descend steeply and pass through the village of Chiro Leba to follow a stream bed until we reach the large Mesheha River. We'll cross the river and follow a path up the east side of the valley to Ambikwa village, (3200m) where our camp sits in a little meadow next to a small church. Todays 17km walk is expected to take around 11hrs. Starting before sunrise we follow the main valley up and climb steeply via Mizma village houses to reach a ridge crest and open grassy slopes (3700m) on our invigorating ascent of Ethiopia's highest mountain. Next we traverse around ridges and climb more steeply to a broad col at 4250m. Keep an eye open for giant lobelia, by far the most spectacular plant of this region with flower stalks up to 8m high. Eventually we enter a huge semicircular basin of rocky peaks and buttresses - Ras Dashen. The last section involves some rock scrambling and climbing to a fine viewpoint at 4543m. We'll spend the rest of the day hiking back to our camp. Todyas 21km walk is expected to take around 10hrs. Today we recross the Mesheha River as we make our way to Arkwasiye and our campsite there (3150m). Todays 15km walk is expected to take around 6hrs. We have an early start this morning for our trek to Chenek (3620m). On arrival we have a packed lunch before our drive to Gondar. The drive takes three to four hours and about a third of the road is unmade. On arrival we check into our hotel for the night. Todays 12km walk is expected to take around 6hrs.